University of Texas Medical Branch, Original 1891 Building. Courtesy of the University of Texas at Austin. Image available on the Internet and included in accordance with Title 17 U.S.C. Section 107. American Medical Association Logo. Courtesy of Columbia University. Image available on the Internet and included in accordance with Title 17 U.S.C. Section 107. MEDICAL RESEARCH. Organized medical research in Texas began at the University of Texas Medical Branch in Galveston during the 1890s. Nearly all of the original faculty published clinical case reports as a way of advancing the diagnostic and therapeutic capabilities of their fellow professionals. A few of these early professors-William Spencer Carter, Allen John Smith, and David Cerna-performed some experimental studies. Carter evaluated the effects of thyroidectomy and parathyroidectomy on dogs, Cerna determined the effects of certain drugs on various physiological functions of dogs, and Smith determined the conditions needed for formaldehyde to kill variously prepared cultures of bacteria that caused scarlet fever, typhoid fever, anthrax, and diphtheria. Before World War II some pharmaceutical companies and the American Medical Association gave tiny amounts of money for research to a few UTMB professors, including George R. Herrmann and Meyer Bodansky. Bodansky studied amino-acid and fatty-acid metabolism, and Herrmann investigated the cardiovascular system. Bodansky and Herrmann were among the thirty-nine Texans included in American Men of Science for 1933. Chauncey Leake. Courtesy of UTMB Health. Image available on the Internet and included in accordance with Title 17 U.S.C. Section 107. Photograph, Picture of the Roy and Lillie Cullen Building at the Baylor College of Medicine. Courtesy of Baylor College of Medicine. Image available on the Internet and included in accordance with Title 17 U.S.C. Section 107. After the war ended, Chauncey Leake, a pharmacologist and the only Ph.D. yet to serve as UTMB's chief administrative officer, urged the faculty to apply for grants from the federal agencies that decided to support large-scale medical-research endeavors at leading university medical centers. Dollars from United States Public Health Service agencies for research trickled into Galveston between 1946 and 1948 ($92,195), then grew steadily to a total of almost $10 million during the twenty years between 1946 and 1965. During these same years physicians and scientists at the Baylor School of Medicine in Houston acquired more than $22 million from United States Public Health Service research grants, those at the University of Texas units in Houston more than $13 million, and those at the Southwestern Medical School in Dallas more than $9 million. The faculty employed by these academic institutions during the 1940s, 1950s, and 1960s exhibited more interest in medical research than ever before. Trustees and regents added buildings to support extensive research efforts, such as Baylor's Roy and Lillie Cullen Building in the Texas Medical Center (1947), the Gail Borden Laboratory Building at UTMB (1952), and the Cary Basic Science Building at UT Southwestern in Dallas (1955). Doctoral and master's degree programs in the biomedical sciences expanded dramatically after 1950. In 1973 the UT Board of Regents formally recognized the importance of these programs by establishing graduate schools of the biomedical sciences as separate components of the four UT academic medical centers in Galveston, Houston, Dallas, and San Antonio. Michael E. DeBakey and Denton Cooley. Courtesy of the New York Times. Image available on the Internet and included in accordance with Title 17 U.S.C. Section 107. Dr. Denton Cooley, seated, and fellow surgeons at the Texas Heart Institute performed 100,000 open-heart surgeries on January 10, 2001. Courtesy of the Academy of Achievement. Image available on the Internet and included in accordance with Title 17 U.S.C. Section 107. Dr. Giulio Draetta, a professor and researcher in a laboratory at the M. D. Anderson Cancer Center. Courtesy of Eric Kayne. Image available on the Internet and included in accordance with Title 17 U.S.C. Section 107. A Skin Graft Operation at the Shriners Burns Institute, Galveston, 1966. Courtesy of the Houston Chronicle. Image available on the Internet and included in accordance with Title 17 U.S.C. Section 107. Researchers in Texas tackled many kinds of medical problems. At Baylor, doctors evaluated new drugs, investigated plasma substitutes and other substances used in the treatment of shock, determined the value of new antibiotics in treating infectious diseases, studied radioisotopes used in diagnosis and treatment, experimentally demonstrated the transmission of viruses in certain diseases, and discovered some basic cellular functions. Michael DeBakey, Denton Cooley, and many others in Houston revolutionized cardiovascular surgery by developing new techniques for the treatment of patients with congenital anomalies, aneurysms, and vascular-occlusive diseases. 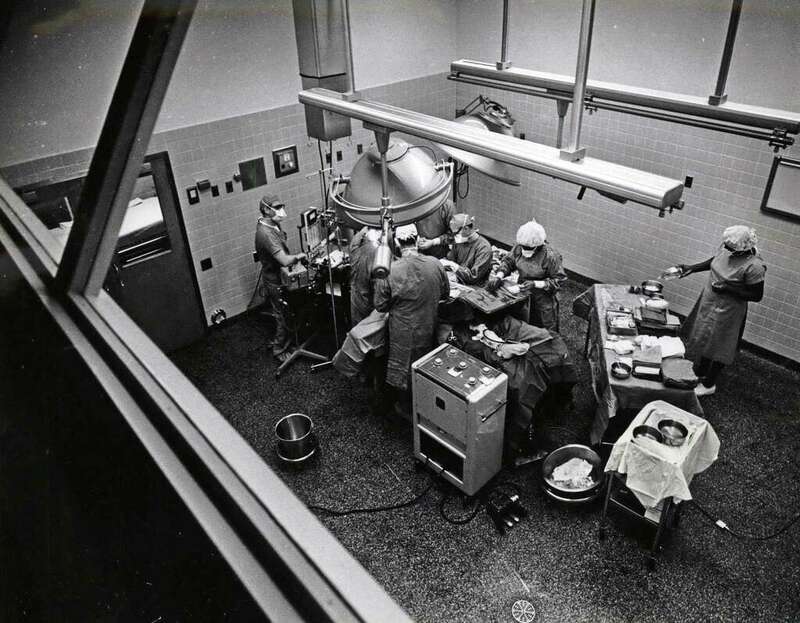 Using knowledge obtained in the Cullen Cardiovascular Surgical Research Laboratories (established in 1972) and the Clayton Foundation for Research Invasive Laboratory (opened in 1974), surgeons at the Texas Heart Institute performed their 50,000th open-heart operation on February 16, 1983. Jorge Awapara, Leon Dmochowski, T. C. Hsu, R. Lee Clark, John S. Stehlin, Jr, and Clifton D. Howe were among the many scientists at the University of Texas M.D. Anderson Hospital and Tumor Institute who conducted basic and clinical investigations during the middle years of the twentieth century. By 1961 these scientists were participating in 242 research projects. By the end of 1991 forty-three volumes of the institution's Cancer Bulletin contained reports of hundreds of studies performed to improve our understanding of the causes and treatment of cancer. After its opening in March of 1966 the Shriners Burns Institute in Galveston became another major center for innovative medical research in Texas. Since that time SBI staff have engaged in many research projects to improve the medical and surgical care of burned children. In the spring of 1992 SBI staff moved into a new $40 million, eight-story, thirty-bed hospital that employs 300 scientists and hospital personnel. Chart of the Share of US Biomedical Research Funding, 2012, from the Journal of the American Medical Association. Courtesy of PhRMA. Image available on the Internet and included in accordance with Title 17 U.S.C. Section 107. Joseph L. Goldstein, pictured right, and Michael S. Brown. Courtesy of Elsevier. Image available on the Internet and included in accordance with Title 17 U.S.C. Section 107. M. D. Anderson Cancer Center Examination Room. Image available on the Internet and included in accordance with Title 17 U.S.C. Section 107. Truman G. Blocker, Jr., Donald Duncan, George William Eggers, Arthur Grollman, M. Mason Guest, Dudley Jackson, Sr., and Edgar J. Poth (to name only a few) were investigators who utilized federal and private dollars to conduct biomedical research. After the 1960s scientists in Texas successfully competed for millions of federal and private dollars that supported many research projects. Between 1966 and 1985, for example, scientists at Baylor acquired more than $376 million from United States Public Health Service agencies. From these same agencies UTMB received more than $127 million, the UT Health Science Center in Dallas more than $278 million, the UT Cancer Center and Health Science Center in Houston more than $374 million, and the UT Health Science Center in San Antonio more than $126 million. Private foundations, such as the Moody Foundation, the M. D. Anderson Foundation, the Southwestern Medical Foundation, and the Southwest Foundation for Biomedical Research, also contributed millions of dollars for medical research. Utilizing money from these sources to equip and staff their labs at the University of Texas Health Science Center in Dallas, Joseph L. Goldstein and Michael S. Brown performed research that was recognized internationally when they received the Nobel Prize in physiology and medicine in 1985. Some academic institutions have established specialized research centers. UTMB organized a Marine Biomedical Institute (1969), an Institute for the Medical Humanities (1973), a Center for Molecular Science (1991), and a Center for Biomedical Engineering (1991). Baylor College of Medicine, with almost $10 million in funding, established an AIDS Research Center in 1991. In early 1992 the University of Texas Health Sciences Center in Dallas received private donations amounting to $85 million for support of research endeavors. A Researcher at the Texas Biomedical Research Institute. Courtesy of Clem Spalding and the Texas Biomedical Research Institute. Image available on the Internet and included in accordance with Title 17 U.S.C. Section 107. The nine major academic medical centers in Texas spent about $560 million on biomedical research during fiscal year 1991, with federal funds accounting for approximately half of this total. Millions of federal dollars have also been used for scientific studies conducted at the School of Aerospace Medicine in San Antonio and other military hospitals in Texas and at the Lyndon B. Johnson Space Center in Houston. See also HEALTH AND MEDICINE, AEROSPACE MEDICINE. Chester R. Burns, "The Health Sciences," in 100 Years of Science and Technology in Texas, ed. Leo J. Klosterman, Loyd S. Swenson, and Sylvia Rose (Houston: Rice University Press, 1986). Mark Richardson, "Medical Research in Texas," Texas Medicine 88 (June 1992). Handbook of Texas Online, Chester R. Burns, "MEDICAL RESEARCH," accessed April 19, 2019, http://www.tshaonline.org/handbook/online/articles/smmrj.